This Chainpure kukri is 61 years old. It belonged to a villager in east Nepal who had used it for almost everything. It was his favourite tool. 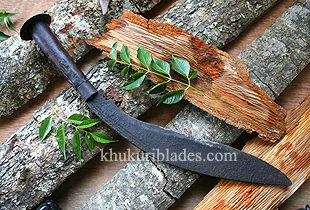 This Chainpure kukri made in Chainpur, east Nepal is 61 years old. It belonged to a villager and a traveller who had used it for everything. It was his favourite tool. He'd never leave home without it. He even added that he had to replace the handle once but there were nothing wrong with the blade from the day it was made. He felt sad selling his favourite tool to me.